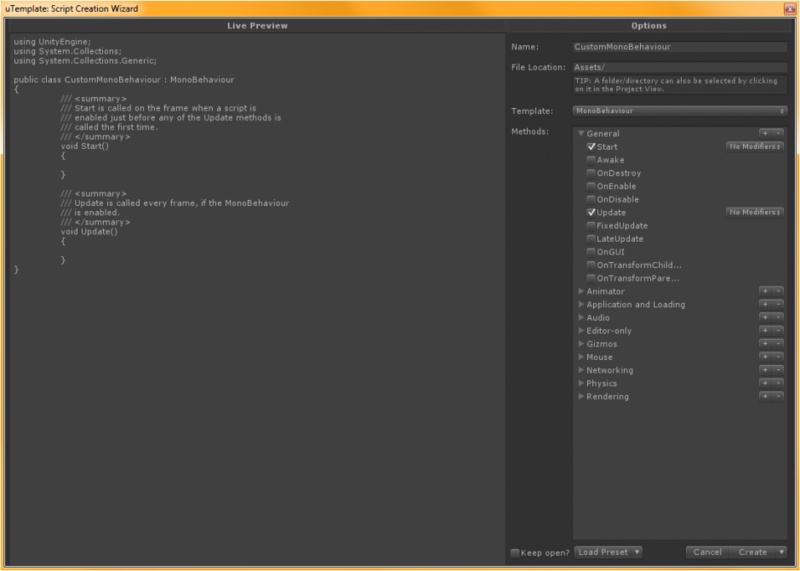 The uTemplate Script Creation Wizard is located under Create->Script From Template. It's also available via the Assets navigation menu under the same headings. All of the script generation options have either inline help tips, or hoverable tooltips. Both are great for a little bit of extra information about what each option does. You can see how the Script Creation Wizard looks below. As you can see, there's a plethora of options at your disposal while creating a script. It may be a bit confusing at first, so here's a quick rundown of each option. The name of your script. This will be the finalized file's name, as well as the class/type name for your new script. Where your script file will be saved. As a handy shortcut, you can click on the directory in Unity's Project view and the Script Creation Wizard will automatically fill in that location for you. A dropdown containing a list of your currently-installed Templates. You can pick a Template from here and start fine-tuning. Modifiers change the accessibility of your methods. You can mix and match modifiers to end up with things like public static, protected virtual, and more. The buttons next to category headings allow you to quickly select and deselect all of the methods under that category. Handy if you know you want all the methods under that heading! The "Preset" button lets you save your current settings to a preset file, or load a preset file. The dropdown arrow allows you to switch between saving and loading presets. The Create button will finalize and create your new script. If Create and Attach is selected (via the dropdown arrow), the script will also be attached to the selected GameObject once the script is generated. The Script Creation Wizard is an extremely powerful, yet intuitive tool that enables some really fine-grained control over your script creation. All of your changes affect the Live Preview panel in real-time, so you can see how your generated script will look before creating it. This makes it super easy to jump in and start experimenting, or to begin creating and saving Presets for later!